Sudanese police fired tear gas at dozens of demonstrators on Friday in the cities of Omdurman and Atbara, witnesses said, where people gathered in a third day of protests driven by price rises and a nationwide cash shortage. The protests that began after noon prayers were smaller than those on Thursday, when at least eight people were reportedly killed as thousands took to the streets, some calling for the overthrow of President Omar al-Bashir. The protests are among the biggest the country has seen in five years. There were also small-scale demonstrations across at least eight neighborhoods in the capital Khartoum on Friday, but they were short-lived, witnesses said. Police had stepped up their presence outside Khartoum’s main mosques ahead of an anticipated third day of demonstrations. Hundreds of Sudanese web users reported issues with internet access, particularly on social networks like Facebook, Twitter and WhatsApp, late on Thursday and into Friday. 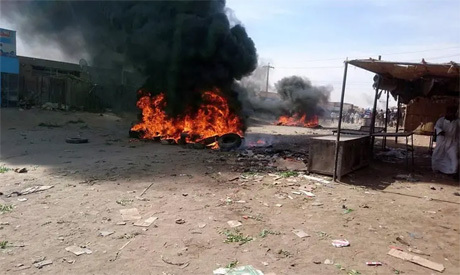 Demonstrators on Thursday torched ruling party offices in the cities of Dongola and Atbara, while security forces fired tear gas to disperse crowds in Khartoum, where small and scattered protests continued into the night. Public anger has been building over price rises, inflation and other economic hardships, including a doubling in the cost of bread this year and limits on bank withdrawals. Long lines continued to stretch outside of ATMs and bakeries in Khartoum early on Friday. Sudan’s economy has struggled to recover from the loss of three quarters of its oil output - its main source of foreign currency - when South Sudan seceded in 2011. *The story was edited by Ahram Online.